Bell says two major lines were cut by third-party construction work and calls the situation "extraordinary." An accidental snip of two major cables caused a cell service outage across the four Atlantic Canadian provinces today. Bell says two major cables were cut by third-party construction. The cut affected approximately 885 LTE cellular sites across Atlantic Canada, Telus said on its website. Today’s outages in Atlantic Canada were extraordinary situations in which 2 major fibre links were cut by 3rd party construction work. In a press release sent earlier, Bell spokesman Nathan Gibson said, "The outage was caused by accidental damage to multiple fibre network links. Bell apologizes to our customers for the disruption." The outage started around 11:20 a.m. NT and affected the Telus (including Koodo) and Bell networks. It wiped out cell phones and debit and credit machines, and caused flight cancellations across Newfoundland and Labrador. Bell services were restored as of 4:30 p.m. NT, after a rerouting and repair of network infrastructure. At St. John's International Airport, Air Canada passengers had to be manually checked in for their flights, even if they had checked in online, and the airline cancelled one flight from Halifax. 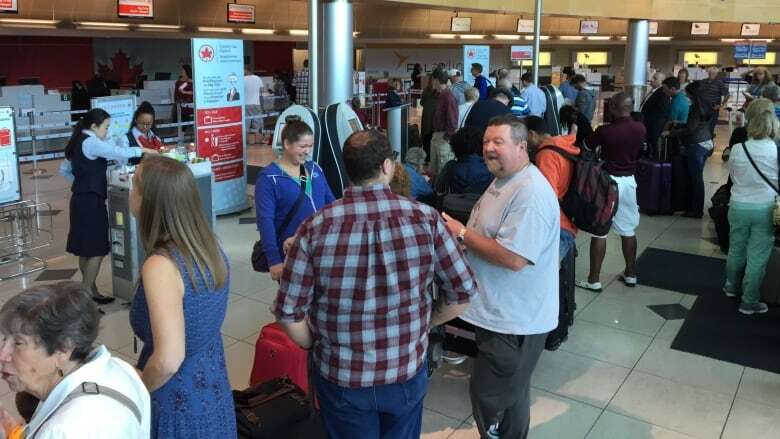 Air Canada brought pizza, coffee and snacks to its long lines of waiting passengers. Porter flights were cancelled, but WestJet flights went ahead. In St. John's, the Royal Newfoundland Constabulary warned that people wouldn't be able to dial 911 from some phones, though the service itself wasn't down during the hours-long outage. They provided alternate numbers for people who still had phone service to call in an emergency, and Eastern Health stationed ambulances across St. John's for emergency services. The St. John's Regional Fire Department issued a release suggesting people in an emergency situation who were experiencing phone problems to try a neighbour's phone or pay phone, or to go to the nearest fire or police station. The outage caused problems for debit and credit machines across the province, and some bank branches in the province closed their doors Friday. Some businesses and brands in the province had a bit of fun with the outage.